voco™ St David’s Cardiff HotelGlobal award winning and the only AA rated 5 star luxury hotel in Cardiff, voco™ St David’s Cardiff is located on the stunning waterfront of Cardiff Bay and is one of the very finest hotels in Cardiff. voco™ St David’s Cardiff creates a striking landmark. Dynamic in style, the building incorporates a glass-backed atrium from floor to ceiling, giving a vision of space and natural light, the ultimate in comfort, spa leisure facilities and creative cuisine. vovo™ St David’s Cardiff is a fresh, modern style with 142 bedrooms and suites, most with private deck style balconies and views across the bay. With its dedicated conference centre, award winning Marine Spa facilities and The Admiral Restaurant & Bar, the St David’s Hotel continues to guarantee its position as one of the leading hotels in Wales. 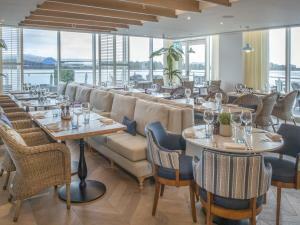 At The Admiral the branding incorporates nautical nuances to represent Cardiff Bay’s maritime trading history, with light and fresh space which is perfect for laid-back casual dining. With water lapping its edges and breathtaking views across the Bay, it is an inspirational place to do business in the dedicated events centre, to celebrate your wedding or getaway on a short break and explore the fantastic local attractions.The Admiral draws inspiration from the eclectic food culture and bold flavours of Australasia and Asia-Pacific, while looking closer to home for the best of seasonal Welsh produce. There is an all-day dining menu which features small plates to share including Prawn tempura with red-eye mayonnaise and Beetroot with Pant-Ysgawn goat’s cheese bon bons, followed by a grill section showcasing some of the best meat and fish in Wales such as Dry-aged Cefyn Manor beef and Carmarthenshire lamb. The restaurant’s signature dessert is a contemporary take on the classic flavours of Peach Melba. Rum cocktails are the anchor point for The Admiral’s cocktail list, taking their cue from the area’s naval history; while twisted classics breathe new life into some old favourites. The wine list has a new world bias to reflect the nature of the food with a ship’s manifest log recording a few special bottles that change regularly. As for beer, The Admiral will feature several local breweries as well as some big names on the UK craft beer scene. Cardiff International Airport, 13 miles. Cardiff International Airport has daily fights to the main capitals of Europe and is only 20 minutes by car from the hotel. We will happily arrange a taxi for you on request, at the time of booking. ride from Cardiff station - we will happily arrange this for you, on request at the time of booking. There are 65 parking spaces available at the hotel. From the M4: Exit the M4 motorway at Junction 33 and follow signs for A4232. Stay on this dual carriageway for approximately 9 miles/14.5km towards Cardiff Bay, exit A4232 (Techniquest exit) directly after crossing the bay and just before the tunnel underpass. At the roundabout, take the first left, then immediate right before Techniquest into Havannah Street. roundabout, take the first left, then immediate right before Techniquest into Havannah Street.